Jamie Cat Callan: Squash Blossom Surprise! 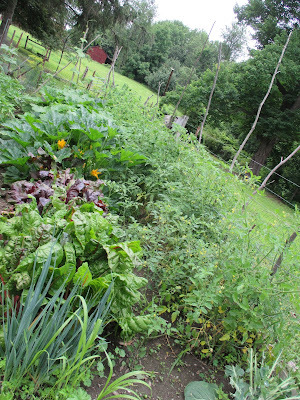 The garden at La Belle Farm is looking very good now that we're in the full bloom of summer. We have spinach, leeks, tomatoes, zucchini, Swiss chard, squash and beets. We would have had brussel sprouts, but our Woodchuck-in-residence decided to dig a tunnel into the garden and then he proceeded to gobble down all our brussel spouts. Finally, we blocked his passage, and here you can see how our garden grows. It's small because this is our first year at La Belle Farm. Oooh La La! Squash Blossoms! Dr. Thompson (a.k.a. Farmer Bill) makes an Italian-Asian fusion squash blossom recipe. He stuffs the blossoms with a little mozzarella and just a sliver on anchovy. It gives it a nice salty/savory flavor. Then he dips the flower in beer batter and coat them in tempura flour and the magic begins. Next, he sauteed the blossoms in olive oil and voila! We dip them in soy sauce and eat them with our fingers. So yummy! And since it was our ten year wedding anniversary, we toasted with champagne. Have you cooked squash blossoms, mes amies? I'd love to hear how you prepare them! Happy Anniversary! I've been wanting to try these Merci for the recipe! Yummy! And champagne is the perfect accompaniment!! Happy 10th Anniversary!!! Bonjour chere Jamie...and happy Bastille Day! You have a beautiful garden...what a gift it is to eat your own produce...nothing like it! I have yet to try these amazing blossoms...they do sell them at the farmer's market..and this recipe sounds so yummy. I hope you are having a DELICIOUS summer!